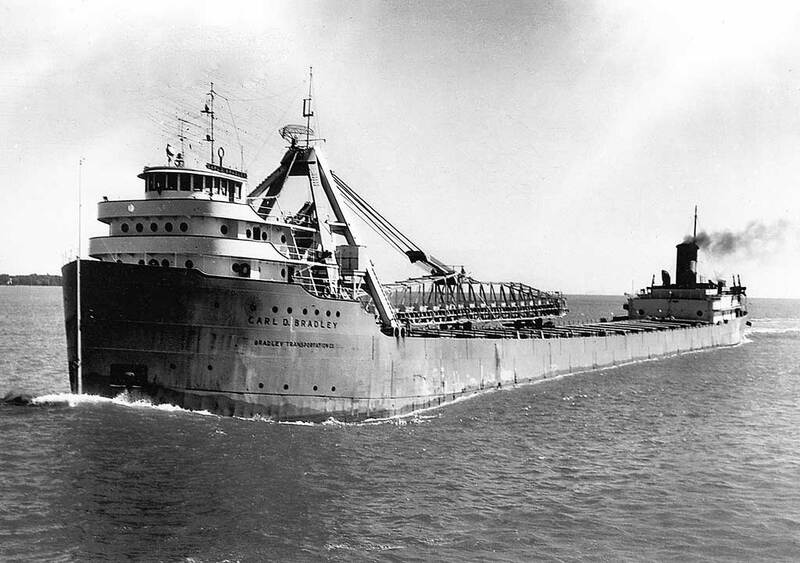 Built by American Shipbuilding Co., Lorain, OH, as hull # 797. 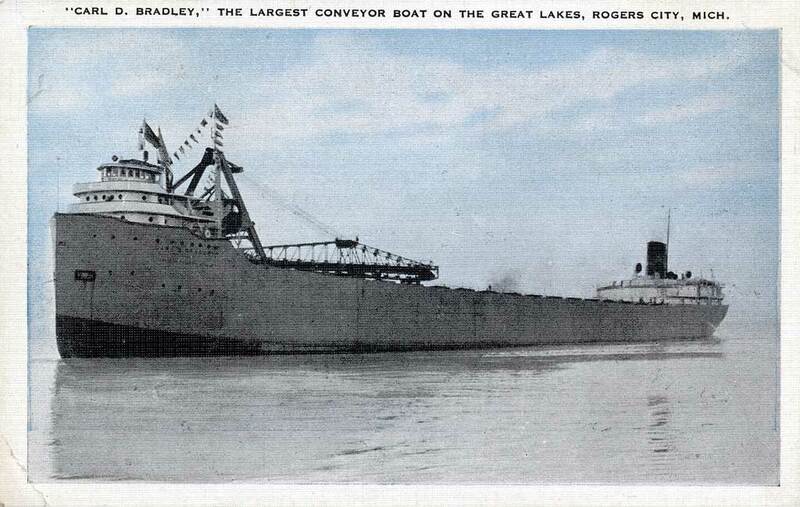 Launched April 9, 1927 as CARL D. BRADLEY (2) for Bradley Transportation Co. of Rogers City, MI. 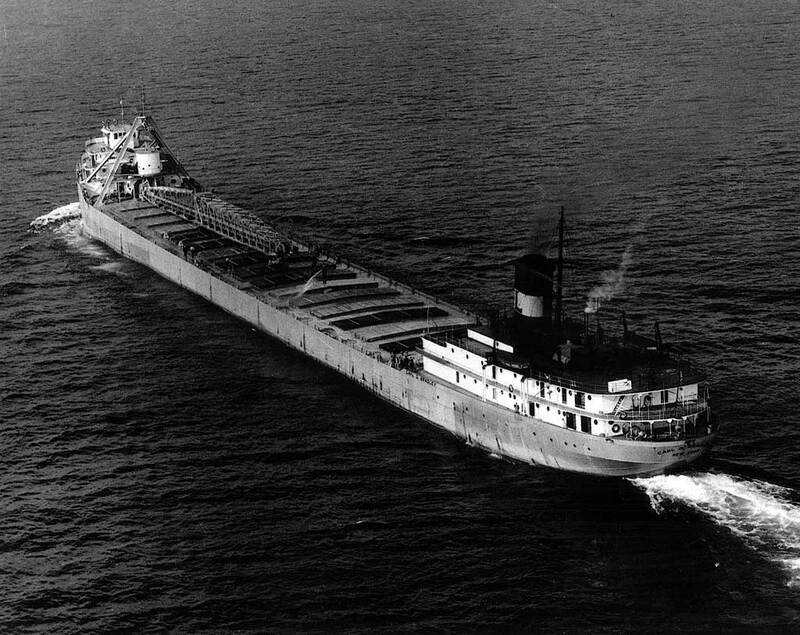 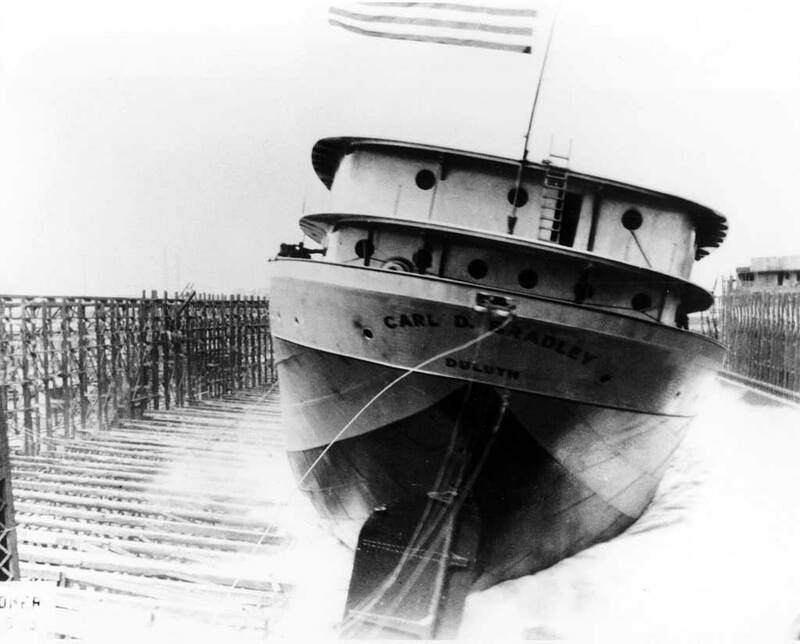 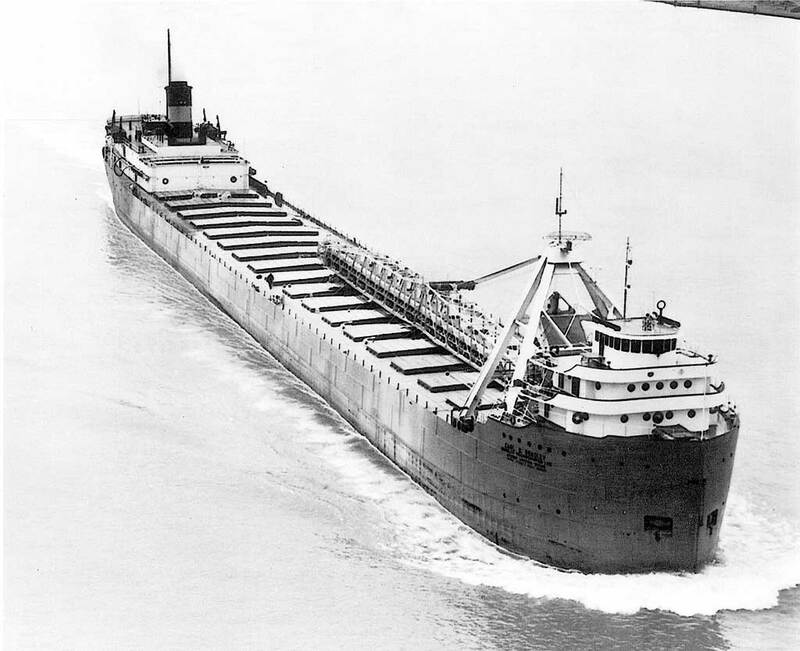 The CARL D. BRADLEY (2) was the largest ship on the Great Lakes at the time of her construction and acknowledged as "Queen of the Lakes". 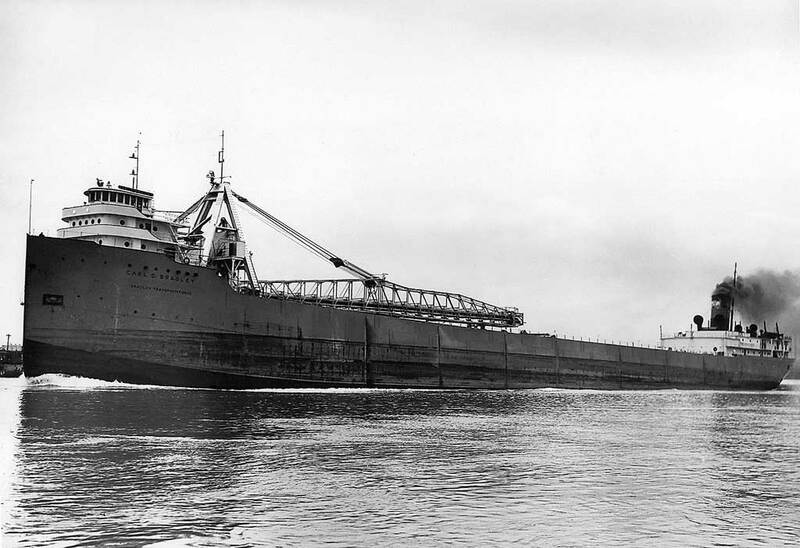 Dimensions: 639' 00" loa x 65' 00" beam x 33' 00" depth; 10,028 GRT, 7,706 NRT. 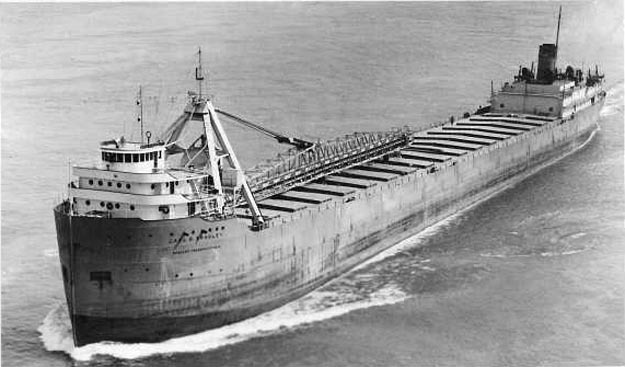 Cargo capacity 14,000 tons crushed stone or 12,000 tons coal. 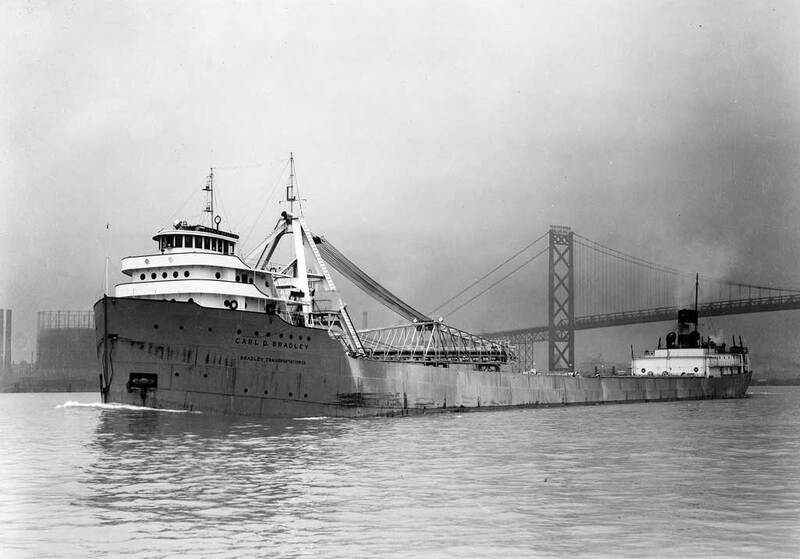 Powered by a General Electric turbo electric direct-drive generating 5,000 s.h.p. 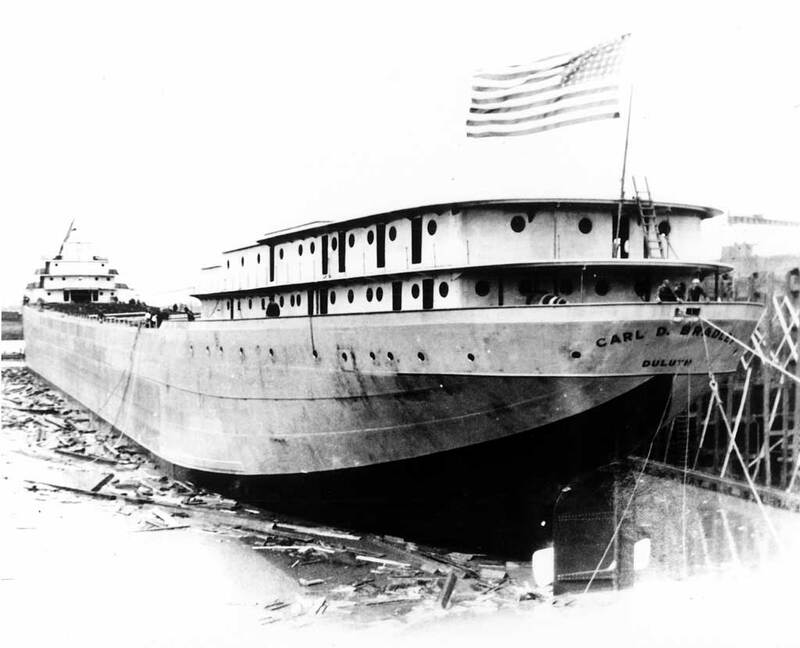 Sailed on maiden voyage arriving at the Port of Calcite on July 28, 1927. 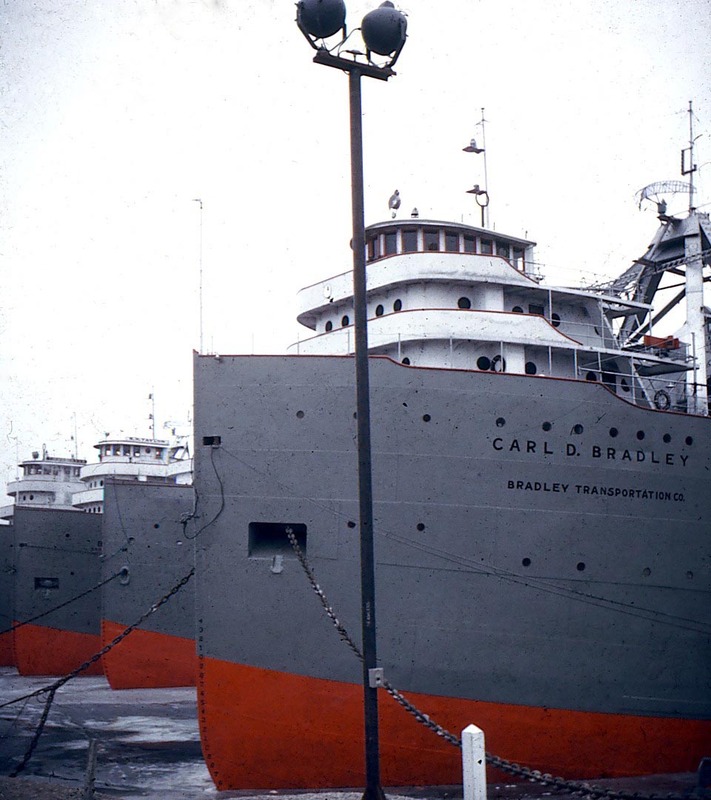 Shortly after 5:30 pm on November 18, 1958 the CARL D. BRADLEY (2) broke up and foundered in a gale that generated up to 60 mph winds on northern Lake Michigan 12 miles southwest of Gull Island. 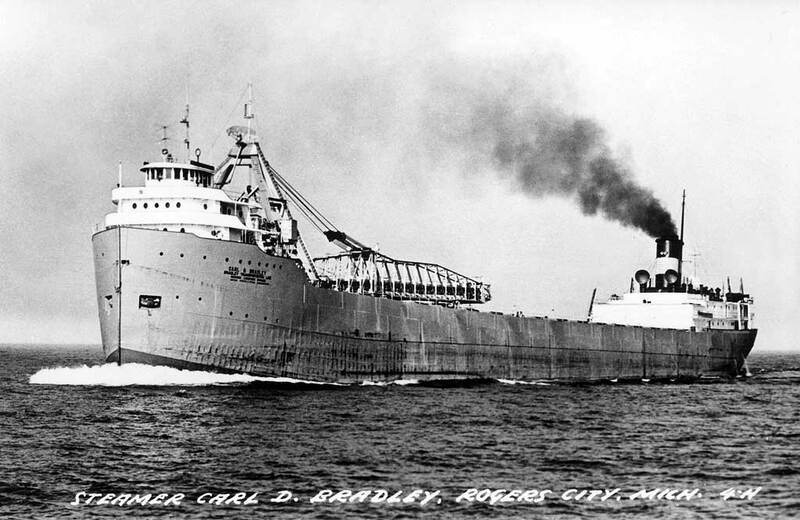 Of the 35 crew members on board at the time of the sinking only 2 survived this tragedy; the CARL D. BRADLEY (2) now rests at a depth of 360 feet broken in two amidships. 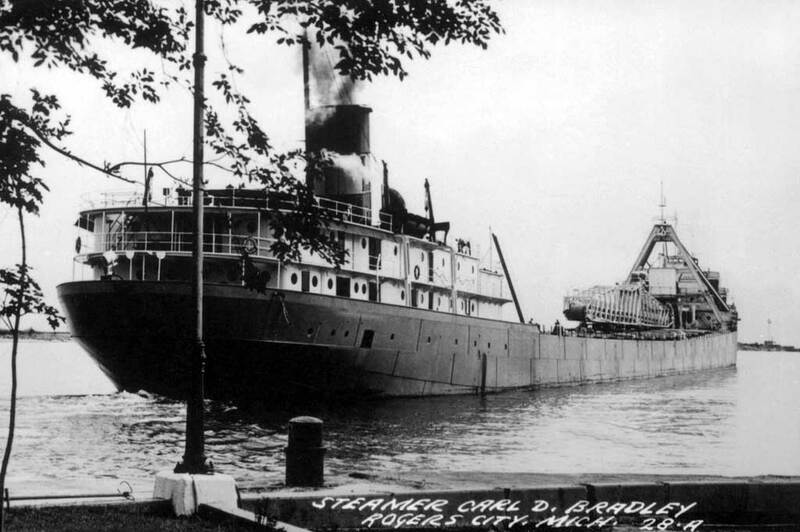 Postcard view prior to launch. 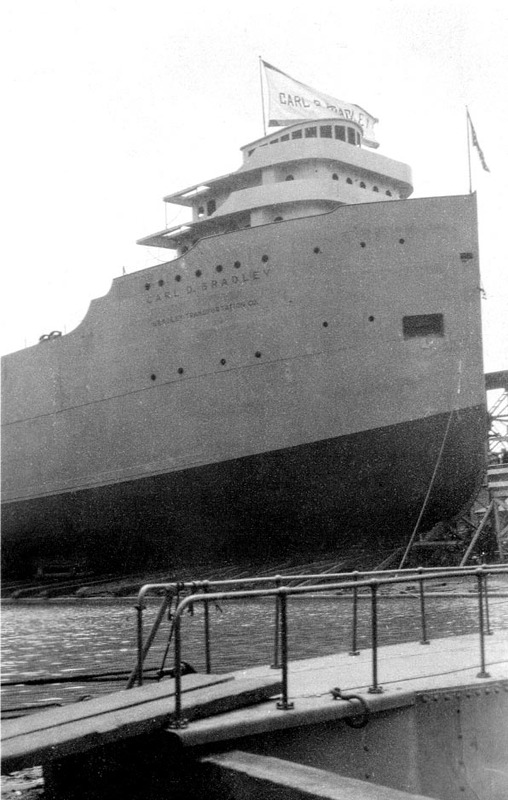 Launching April 9, 1927 at American Shipbuilding Co., Lorain, OH. 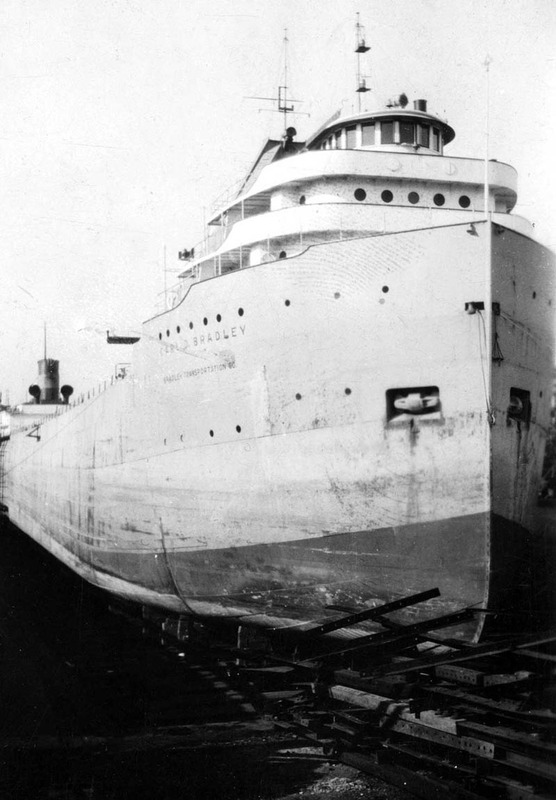 Just launched April 9, 1927, Lorain, OH. 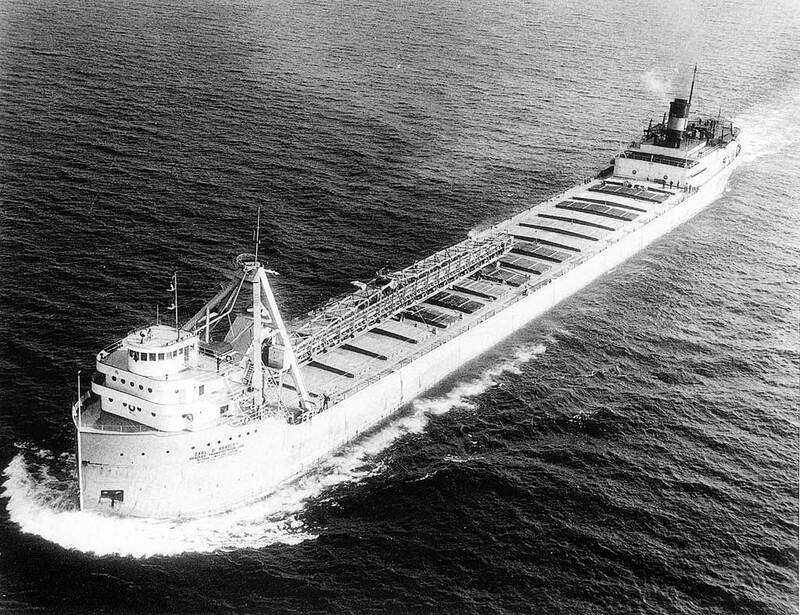 "Longest boat on fresh water". 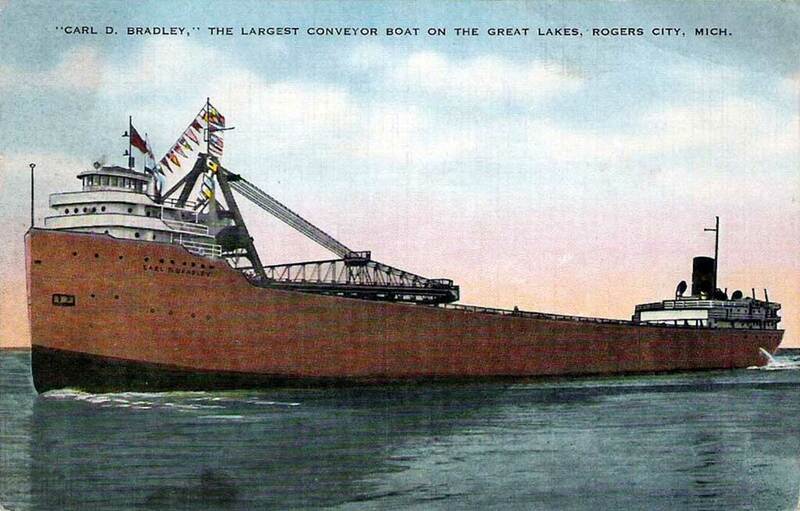 Color variation of previous postcard view. 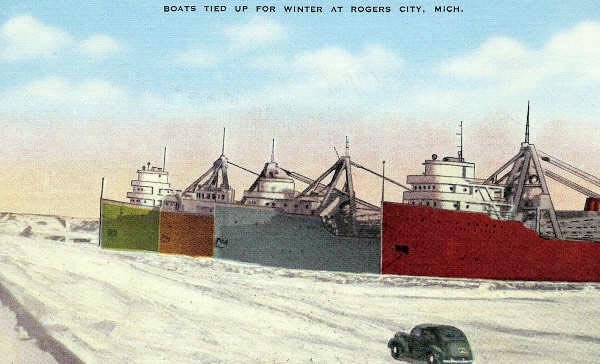 Postcard view of winter lay-up in Rogers City, MI. 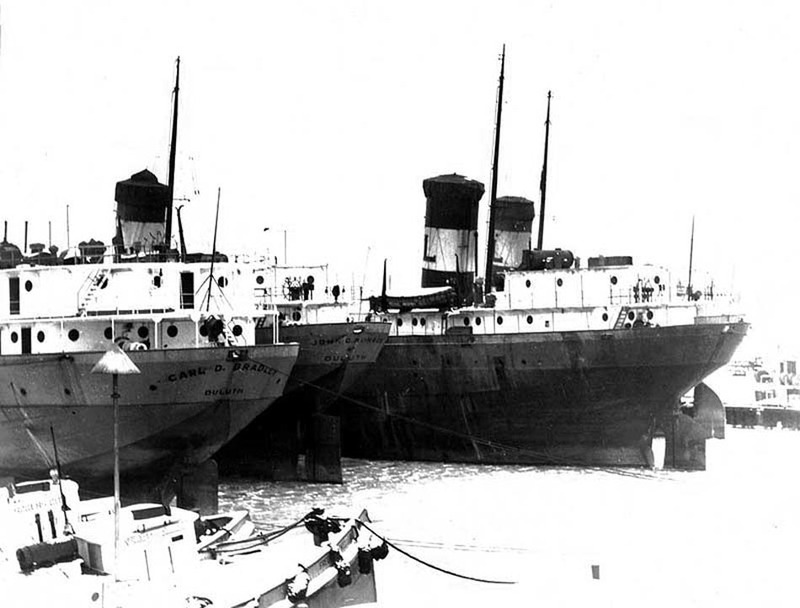 Note the interesting colorization of the fleet. 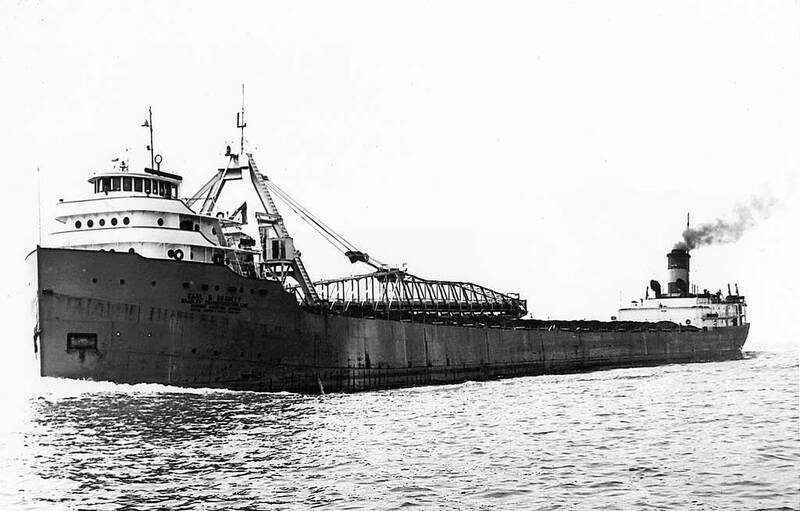 Loading at Calcite in Rogers City, MI 1930's. 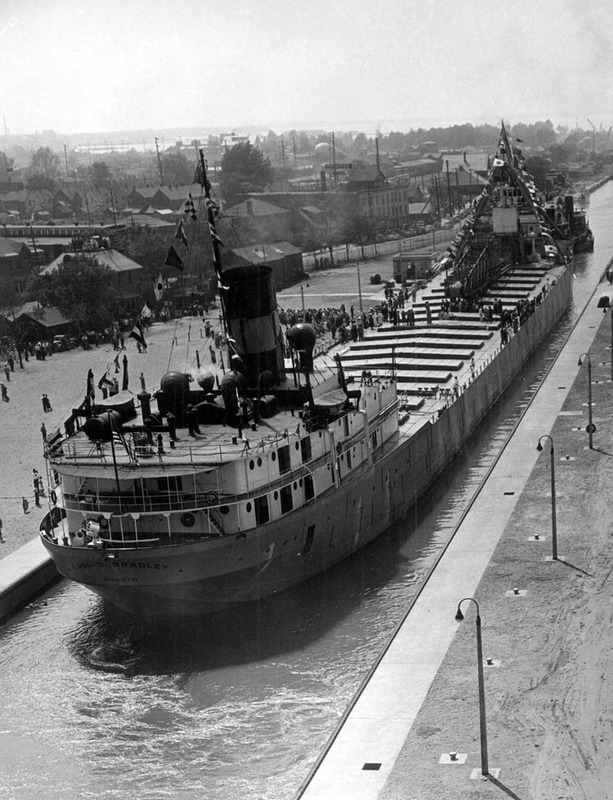 July 11, 1943 Opening Day of the MacArthur Lock. 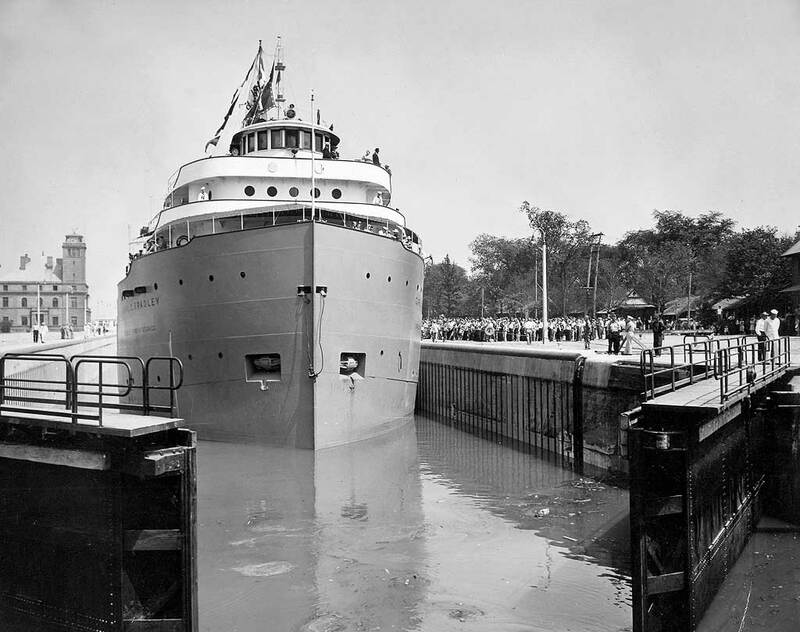 Stern view July 11, 1943 Opening Day of the MacArthur Lock. 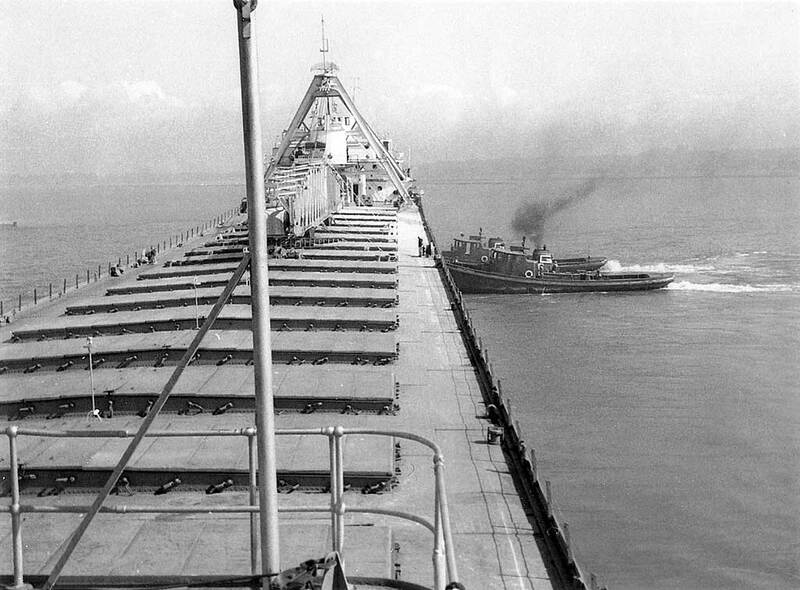 Michigan Limestone fleet at lay up in Calcite, MI December 1944. 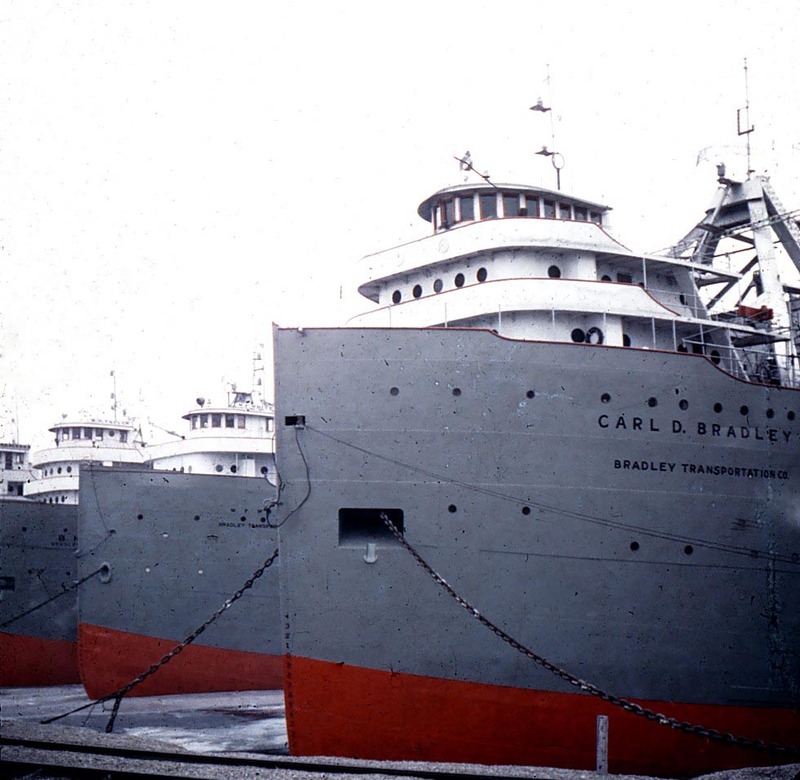 Carl D. Bradley (2), John G. Munson (1), Irvin L. Clymer and T. W. Robinson. 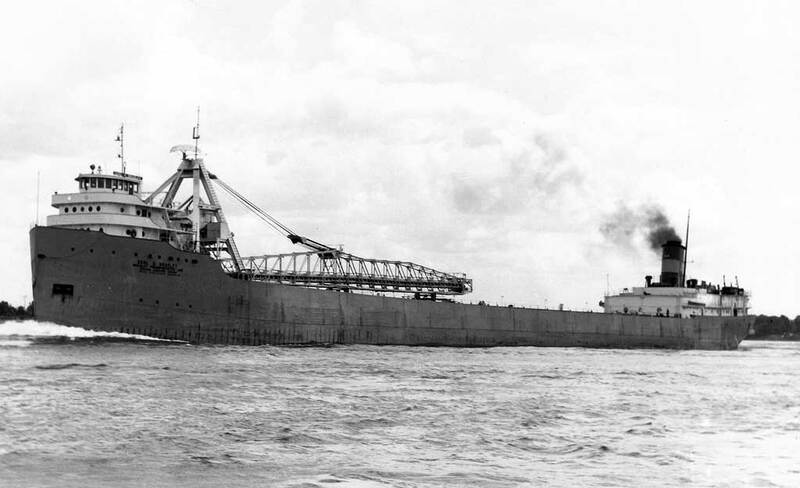 Winter lay-up at Rogers City alongside W. F. White and B. F. Taylor. 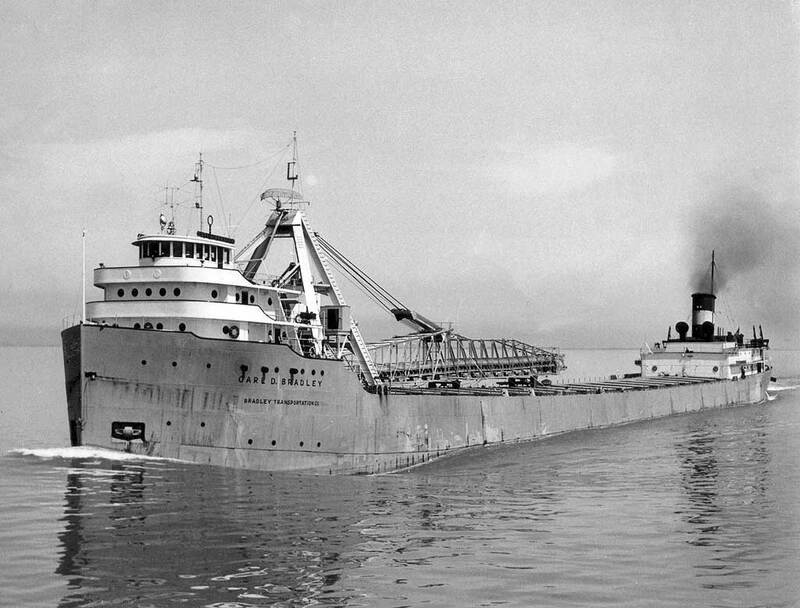 Unloading at Port Huron, MI in 1952. 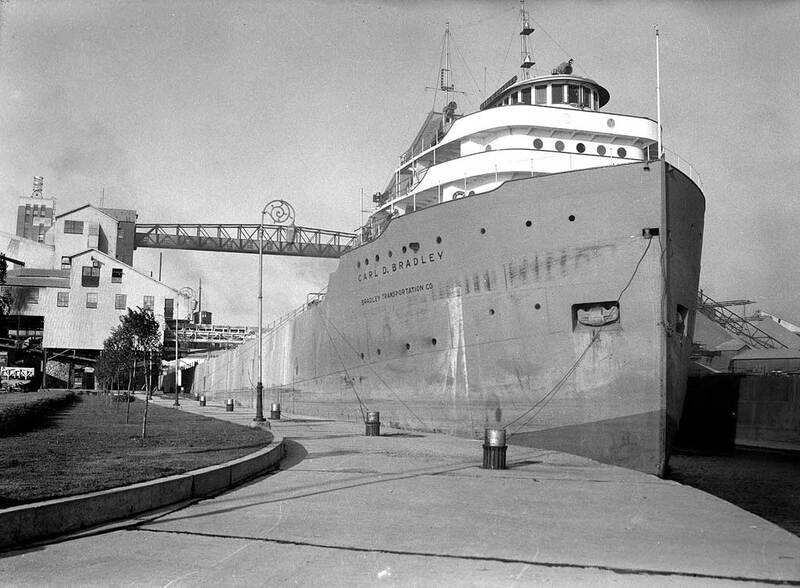 Deck view looking forward 1957. 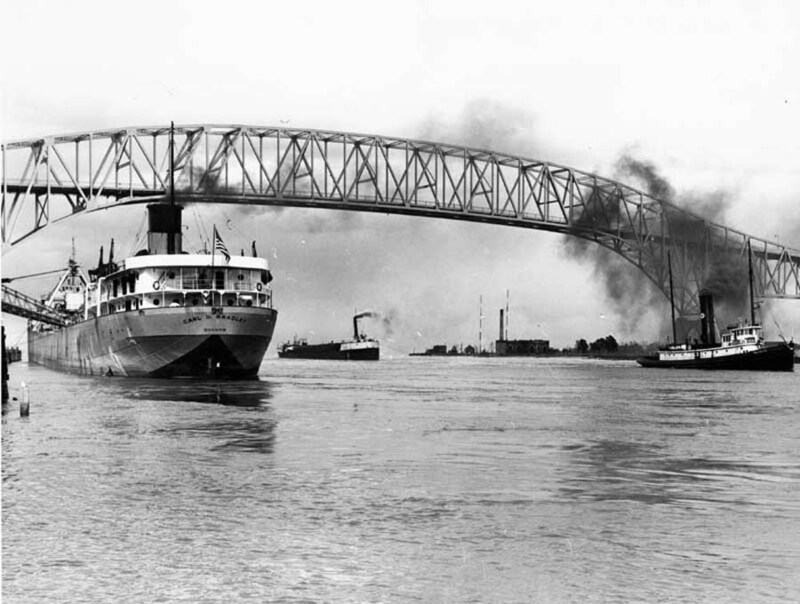 Postcard aerial view passing under the Ambassador Bridge on the Detroit River. 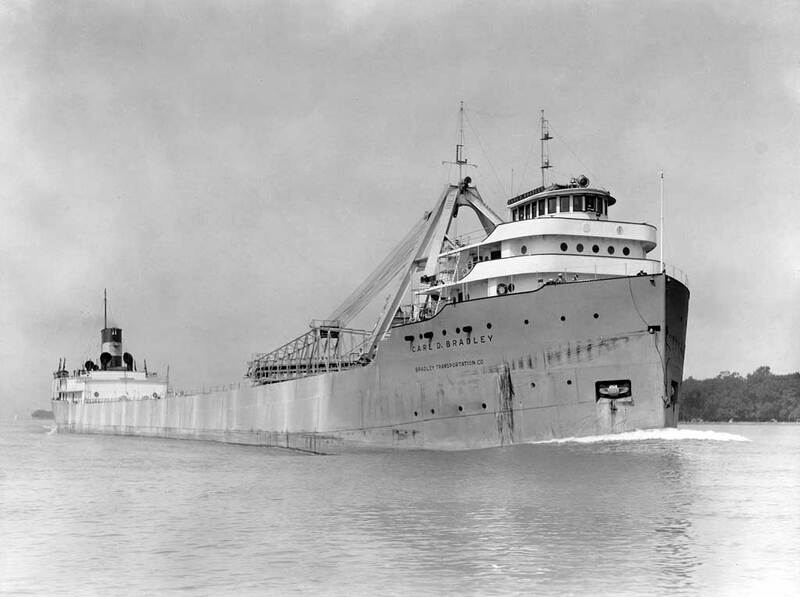 Postcard View upbound Port Huron late 1950's. 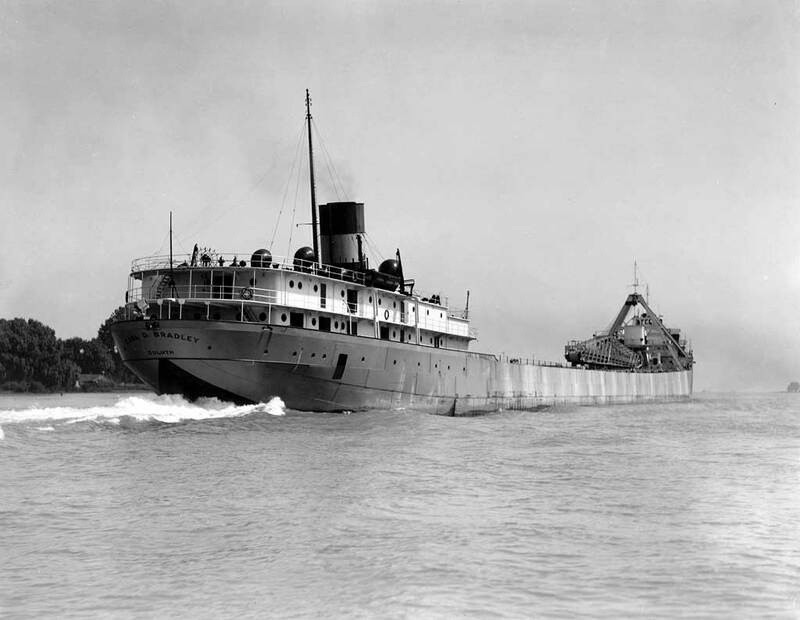 November 1, 1957 taken from Mackinaw Bridge Opening Day ceremonies. 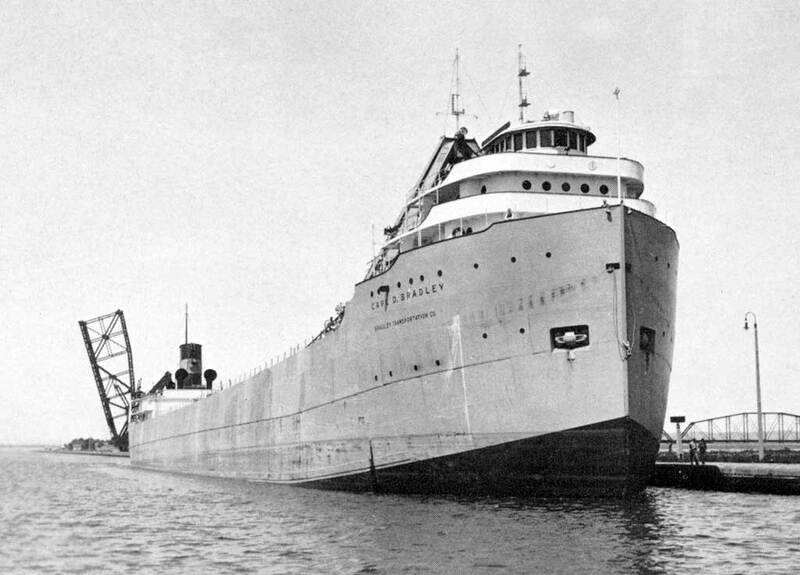 Stern view November 1, 1957 taken from Mackinaw Bridge Opening Day ceremonies. 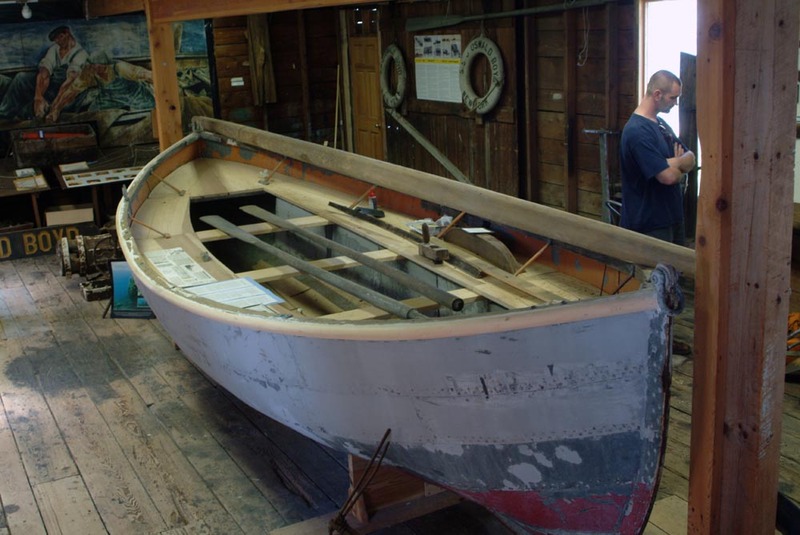 Carl D. Bradley lifeboat on Beaver Island, August 2008. 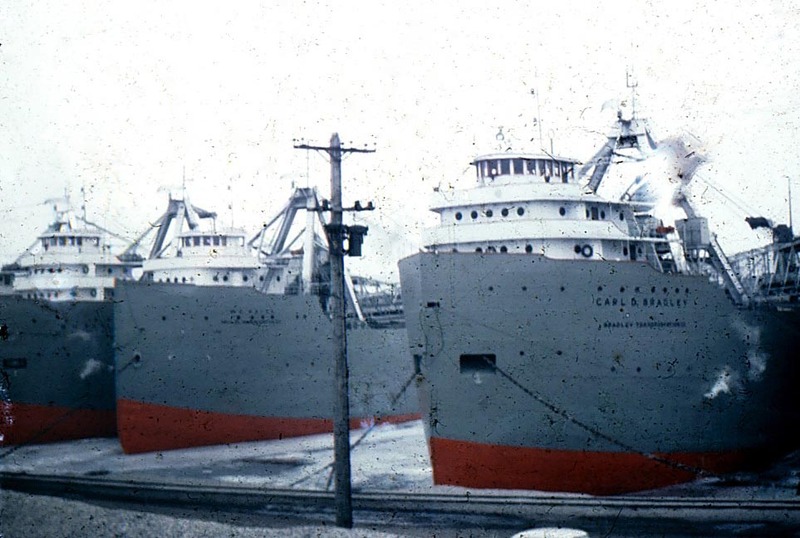 Waterline & full hull scale drawings depicting appearance from late 1950's. 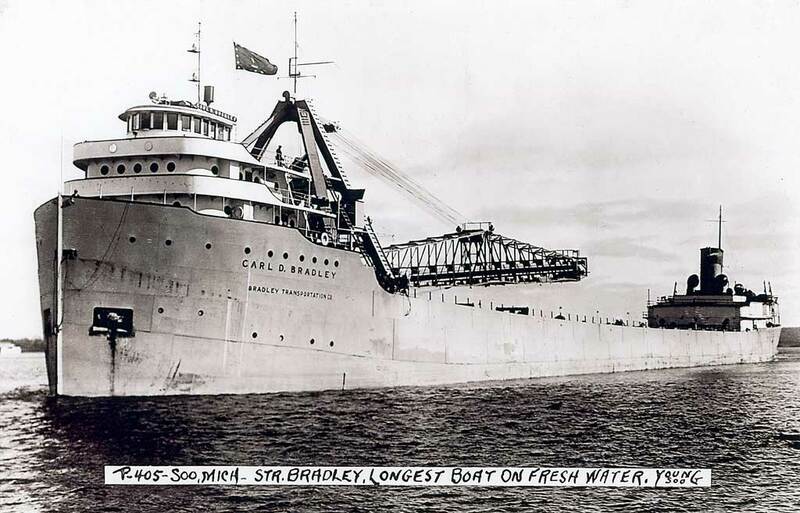 While stationed in Germany with the U.S. Army in 1958 Geri Slater (a former Great Lakes sailor) had heard the news about Carl D. Bradley sinking. 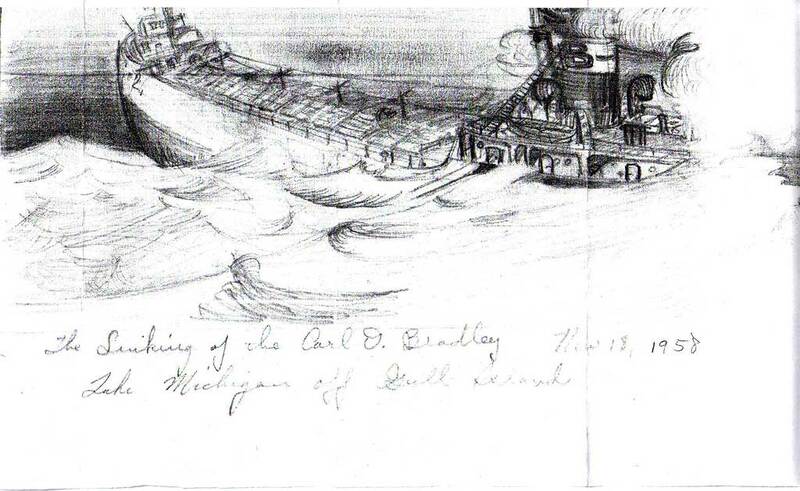 He created this sketch drawing only from memory of what the Bradley looked like.